1. We want you in our life. Trauma survivors want friends, loved ones, and partners. We want a social life which fits into our own comfort zone. We may not be able to adapt to your social preferences in the same way you are able to adapt to ours. This can be for many reasons. For instance, something you enjoy may cause us anxiety. This is where you will need to be willing to accompany us while at the same time accepting we cannot always accompany you. We want the same things in our lives that most people do: happiness, peace, and security. We just sometimes require them under different circumstances, and we need you to both understand and accept this. As a trauma survivor heals, we also gain a maturity and an understanding that not everyone is equipped to be in our lives. We respect you when you are honest about this. If you don’t feel a trauma survivor is the right fit to be in your life, that is okay. You do us a favor when you do not enter our lives if you are not invested emotionally. If you do decide that you want to enter our life, be willing to take things very slow. We need your patience. The more we heal, the more we grow, release triggers and can bloom. Connecting with a healing trauma survivor can be a rewarding and celebratory experience. We really do appreciate when someone cares about us with the intent of supporting our way forward. 2. We need to know we can trust you. Survivors of child abuse are conditioned from very young ages that we cannot trust people who claim to love us. This is because the people we were supposed to be able to trust were the same people who hurt us. Sometimes a child abuse survivor is still learning to define what the meaning of love is. Many of us who have suffered sexual abuse were groomed lovingly into being coercively raped. This can cause confusion when an abuser is also loving toward a child, resulting in confusion when we reach adulthood. It will take more time and open communication to gain our trust. For trauma survivors, things can sometimes be very black and white. When trust is broken with us, it can either take us a long time to regain it, or we do not ever regain it with you again. I am one of those types of people. If someone shows me their true colors are rooted in manipulation, ill intent or disloyalty, I will most likely never interact with that individual again. You may find that many of us have a deep need for loyalty and strong ethics in the people we relate to. When we are in a trusting space with someone, we feel safe. Because we rarely felt safe as children, feeling safe as adults can be a major factor in the balance of our mental health. Be trustworthy and loyal. It can be an honor to be in our lives since many of us rarely allow others in deeply. Get to know what happened to your friend or significant other. Be genuinely interested. You may not understand our childhood experiences. It may feel horrible to you. It is natural to feel disgust at hearing about abuses happening to children. This makes you human. It means you care. We appreciate you for feeling WITH us. When we are healed, many of us survivors do not live a daily private life of continually speaking of our trauma. However, understanding the depth of what has happened to us and how it has affected us will help you understand who we are. Some of the things you might hear may be difficult to wrap your head around. Imagine having experienced it. We survivors often feel the same way about our own experiences. Be willing to listen with acceptance. Remember that you do not need to have the same experiences as someone else to understand and accept their experiences. If we write about our trauma, be willing to read it. Once, I dated a man who asked me about my childhood. I suggested that he read my book, Cult Child, which would let him know everything that happened in my childhood. I spent seven years writing my biography. While I can give a summary of my experiences, if someone is going to be in my life on a romantic level, they should be willing to know the details of what I endured. His retort was that he shouldn’t have to read a “manifesto” of my life. He didn’t get any more of my time. Do not speak to us this way. It’s an honor to read our journals and experiences since it is not easy for us to write about it. Healed trauma survivors can be very strong together as friends, business partners and in romantic relationships. Because both have experienced traumas, they will most likely have a higher level of mindfulness and understanding with one another. This can be a strong dynamic. If you are healing, strive to connect with other healing survivors. Healed survivors most often inspire one another. 4. Educate yourself about our impairments. Many child abuse survivors carry impairments such as Complex PTSD, Anxiety, Agoraphobia, Dissociative Identity Disorder, Hypersensitivity, Startle Response, OCD, Depression or other bi-products of what mentally ill people did to us. Because an abuse survivor’s scars are not visible, many people forget their friend or significant other carries such impairments. This can be difficult for us. We want and need you to remember that we have impairments. For example, I am deaf in my right ear. Because of this, I can have higher vocal volumes, especially in loud spaces, or I need others to speak up, so I can hear. Once, when I was watching a movie with a friend, she remembered my hearing impairment and put on subtitles, without me even asking. It warmed my heart. These small moments of mindfulness mean the world to me. If you are interested in personally connecting with a child abuse survivor, educate yourself on what our impairments are about. Read credible information. Learn what the signals are for triggers and how you can be a support person if a trigger happens. The brain is an amazing organ. Learning how trauma affects the brain of a developing child is astronomic in understanding why child abuse survivors operate the way we do. When you can speak our language, it is easier for us to communicate with you. This creates an ease for us. We do not have to struggle in communicating what we may be going through, because we are aware that you get it. For example, a couple signs of a trigger could be the pupils of the eyes becoming larger and a frozen body stance. Knowing these symptoms can help you recognize them if they arise. Sometimes a trauma survivor feels shame and stays quiet about what is happening in our head. When you recognize the signs of our triggers, and softly rein us in, it creates an open channel for us to move through it. As we heal, you will notice that changes occur. Things which once triggered us may not trigger us anymore. We may have highs and lows of anxiety or depressive periods depending on what happens in our lives. We don’t deal with situations or see the world the same way as non-trauma adults do. Knowing how our impairments work can give you the tools to support us through this journey. Plus, nerding out on the way the human brain functions can be super fun. 5. Don’t take our abuse personally or try and fix it. You may want to fix everything. You may become frustrated that you cannot fix some things. You will meet child abuse victims who are still in their abuse base. You get to choose what your own comfort level is. Don’t make a victim your pet project. Victims must choose their healing as they learn the tools to do so. You will find yourself exhausted if you fall into the belief that you can fix a person who has not chosen to heal themselves. It is okay to softly move on before you become vested. It is better for all parties involved when you decide responsibly to do so. It can be difficult to watch someone you love have days of crying or silence; a state of being that you may not understand, or even think might be your fault. Remember that not everything is about you. Sometimes we just need to be heard or hugged. Sometimes we need to cry. Let us. This is where holding space is a necessity. A healing survivor will possibly ask for your input for self-care. We may be more open with what we are feeling and dealing with in our head when you hold space for us. There is a saying; Let the past go. I disagree. If trauma survivors could wave a wand and make the past go away, oh, how we would. No. The past holds onto us, and we spend our lives prying its fingers away. As we heal and face our trauma, we learn the art of taking dominion over our memories. We learn that we do not have to relive the flashbacks when they arrive. It takes time to accomplish this state of being. Connecting with a trauma survivor requires a great amount of empathy and patience. If you don’t understand us, study and read up on what we live with each day. I personally respect when someone is honest with me about whether they are or are not a good fit in my life. Be kind. Be gentle. Most of all, be real. Vennie Kocsis is the best-selling author of Cult Child and other publications. She is also a poet. My mother, Doreen Frandi, suffered from severe bipolar disorder and as her daughter, not only she, but I also suffered the stigma that goes with mental illness. Because she had to work to keep her son and herself, she never had the chance to really recover or rehabilitate. She had to abandon me and my younger brother because she endured enough anxiety just trying to care for herself and her firstborn. Life dealt her so many blows that, to this day, I don’t know how she continually mustered the inner resolve to get back into life’s stream. Catherine Zeta Jones, a sufferer of bipolar disorder, had the luxury of being extremely wealthy and therefore able to check herself into a mental health clinic, (no longer called an asylum). No stigma attached to her, just accolades about her bravery in admitting to having the disorder in the first place. My mother was a creative person who had to leave school, which she loved, to help my grandmother care for her four siblings. Their household was violent and unloving. Doreen Frandi never had the opportunity, or the peace, to pursue art or writing which could have helped her cope with her illness. We now know that creativity and study of a subject the mentally ill person is passionate about, can be therapeutic. I am not sure if given the same circumstances as my mother, I would have developed bipolar disorder. However, I do know that when I was a teenager I suffered from depression, including suicidal thoughts, but my sheer will power not to become my mother, drove me to find ways of overcoming it. Later in life, I gained a degree, studied art and began writing, all with passion. I didn’t have time to feel depressed, so focussed was my mind on creating. I was lucky, I had the time, the financial means, (even though I jumped from career to career) and a partner who loves me. Of course, being so intense in one’s passions, can deter friendships and job prospects, but a small price to pay if mental illness is a spectre. And I love the digital age we live in. I have many friends online so I don’t need to become anxious at meeting them when I am not ready to. Yes, I need my solitude and I have learned so well the situations I need to avoid so as to keep anxiety at low levels. The interesting thing is, that I have only just realised lately, (not having the luxury of clinical therapy) that my mantra has always been ‘don’t be, or be seen as, a victim’. I always believed I avoided people because they might emotionally hurt me, partly that is probably true, but now I see that mostly it was avoiding the sense of worthlessness that was instilled in me as a child, whilst enduring the constant scrutiny that my father’s extended family subjected me to lest I show the faintest sign that I would be “just like your mother!”; the mother I didn’t even know. SANE AUSTRALIA aims to prevent the stigma of mental illness in the media and has harnessed the help of prominent people like Andrew Denton to form STIGMAWATCH. This can only be a positive step. But, like sexual abuse, the stories of the mentally ill that reach the public domain are only the tip of the iceberg. We cannot see what is happening within private family homes. The Australian government must budget and plan for better triage facilities which the mentally ill can access easily and early on before tragedies happen, such as in the recent inquest of the father who killed himself and his son because he could not get help immediately. Obviously we need well trained psychiatrists in attendance. Too often, calls for help are ignored or assessed inadequately. Physical health is important and attracts larger budgets and more practitioners, but I recall the old saying “healthy mind, healthy body”. Lets embrace the wholistic approach. The 2011 Federal Budget is especially good news for mothers with severe mental illnesses such as bipolar disorder and depression. More money has been allocated for early intervention, so that mothers and their children are not separated. Mothers with severe mental illness who can’t care for their children, often lose them to social welfare. This causes so much grief and despair for those mothers, heaped on top of whatever mental illness they are already suffering. Not only that, the children taken from their mothers can suffer from the separation trauma for the rest of their lives. I have lived through this because my mother suffered from a severe bipolar disorder and lost her children. None of us fared well at all and our mother had the added burden of deep seated guilt which she never overcame. (See ‘Whatever Happened To Ishtar?’) Far better to offer help before the situation reaches crisis point. In the dark ages of the past, mentally ill mothers were confined to lunatic asylums (as they were then called) with their babies, and all spent the rest of their lives locked up. Thank goodness those days have gone, at least in modern western countries. At the other end of the scale, after asylums were closed down, the mentally ill were all but forgotten. The Richmond Fellowship of NSW, runs the residential and treatment program at Charmian Clift Cottages, which is one of a kind, supporting some of that state’s most vulnerable women and their children. A cluster of individual villas house women, suffering severe mental illness, with their children. The women receive 24 hour emotional and psychiatric support on site as well as ongoing training in parenting skills. Of course, there are not enough villas available, but the money allocated in the latest budget will help. Philip Boyce, Psychiatry Sydney Medical School, Westmead, says this is a godsend for some of these women who will in other circumstances have had their baby taken away from them or placed into care. Why is Mental Illness always at the bottom of the Public Health funding list when we all know that mental and physical health are intertwined!? Mental health expert Patrick McGorry has just been voted Australian of the Year. It is so good to see such a prevalent disorder as mental illness in the news and highlighted. Mr McGorry is also concerned with the plight of refugees, including women and children, held for years in detention centres or ‘Asylums’. It has been well documented how detrimental an effect long periods of institutionalisation has on a person’s mental health. Xenophobia is alive and well but not just in Australia. Western countries as well as developing countries are suspicious of, and fear those from different ethnic groups. Throw in religion and it becomes a volatile mix which is evident in the bloodshed in many countries around the world at the present time. 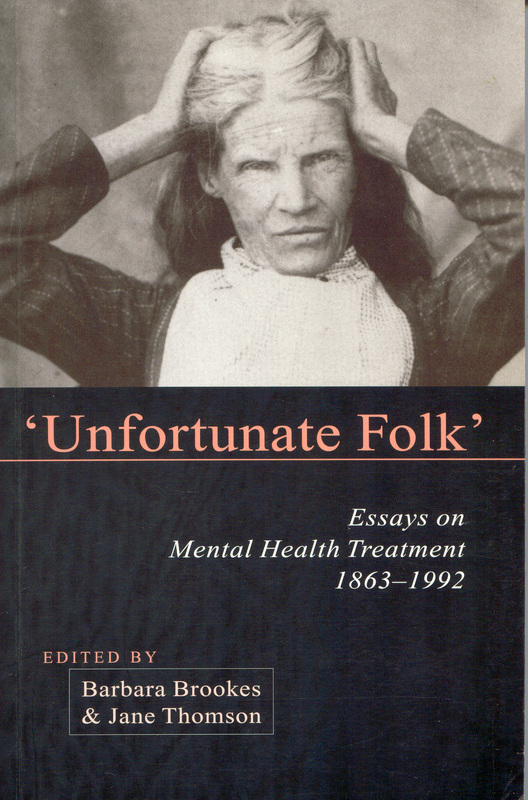 ‘Unfortunate Folk; Essays on Mental Health Treatment 1863-1992’ is an Otago University publication researched and edited by postgraduate history students at University of Otago between 1972 and 2000. Attitudes to mental illness in Australasia haven’t really changed that much I don’t think; political correctness has intervened and made the way we speak about mentally ill patients a little less hostile, that’s all. My mother had a severe bi-polar disorder and spent many years in and out of a mental hospital where she often received Electro-Convulsive Therapy (ECT) in the 1950s and 1960s which eventually left her in a state of permanent mental lethargy. Apparently it was important to keep her emotions tightly controlled in order to level out her mood swings, but in the process killed off all her creativity. The right drugs were not available then. My mother’s traumatic childhood and adolescence probably brought on the disorder and I am sure her stint in a Catholic convent trying unsuccessfully to outrun life in the natural world and become a nun, added to the intensity of her affliction. As I write in my book, ‘Whatever Happened to Ishtar?’ mental illness and its attendant prejudices has had a lasting effect on subsequent generations of her family. The fact that she was Italian certainly played its part in other people’s perception of her displays of emotion. ECT was introduced into mental hospitals in 1943 in Australasia and considerable experimentation with this method of treatment, and new drugs, was carried out on patients. ECT was first used without anaesthetic on patients who were suffering from “over excitability” and depression, both of which my mother “suffered” from. “A consultant…brought them onto the stage and asked them about things and showed off how tragic they were, but I mean, it was a show and I think they were used to showing off as they were expected to. That was part of it, but the really awful thing was when we went around the wards. One particular one that I remember…there was this great big ward and there were a whole lot of what looked like old and bedraggled women with white hair all over everywhere and they were all dressed the same, in white hospital things like you put on when you go for a x-ray and they all came crowding round the trolley, clattering their spoons and tin plates and it was just like feeding the animals, it was absolutely horrendous. That would have been around 1943 …it was just at the very earliest stages of shock treatment …it was certainly the first time of using unmodified ECT, and no anaesthetic, it was horrific”. These places were worse than the prisons in which criminals were incarcerated. The sad thing is that many people still believe that the mentally ill should be locked away somewhere out of sight and out of mind. The above book quotes many interesting statistics: In 1874, of in-patients in mental institutions in Otago NZ there were twice as many men as women (mostly gold miners) and the majority of the women were married. “Most religious denominations were represented but the three major groups were Presbyterian, Anglican and Catholic. The numbers of Presbyterian and Anglican patients roughly mirrored their ratios to the general Otago population”… “However, there were nearly twice as many Catholic patients as there should have been”… “The Irish, who made up the majority of Catholics,were over-represented to the same degree”. The married women often had their children incarcerated with them in the mental institution. “To see the children in the asylum was heartbreaking. Children of tender years were to be found with the adults, and, in some cases sitting on the floor. In any of the asylums they would find little boys and girls hopelessly and helplessly insane, and to keep them here with such surroundings as they had was not, to his mind, the right thing to do”. “Patients, families, the public, politicians, and health professionals all upheld the boundaries between madness and reason. Progress in the decade under question was slow and fragmentary, although the seeds for more radical change were soon being laid. From the later 1950s, de-institutionalisation became the focus of mental health policy, and has remained in controversial favour ever since. 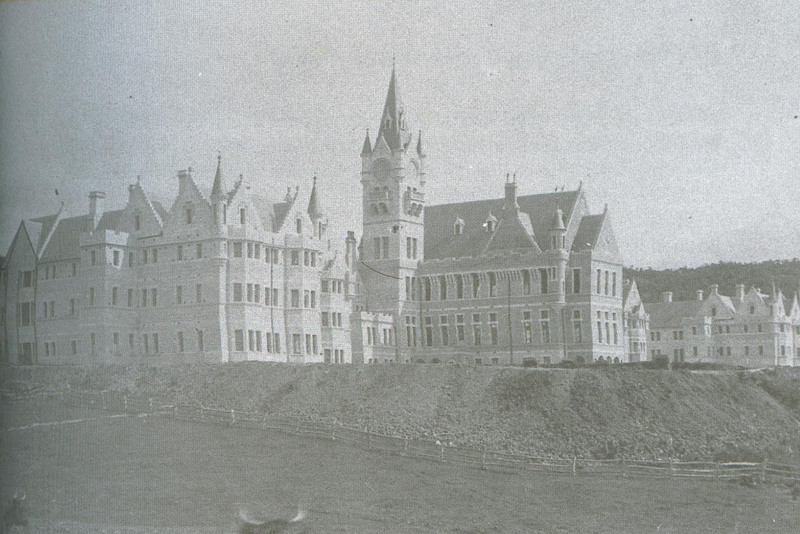 Large and isolated mental hospitals became a thing of the past. But although this achieved some alteration in the social status of the mentally ill it has not completely destroyed the boundary between madness and reason. The legacy of madness as a separate world remains. In essence, the psychiatrist is still an ‘alienist’ treating those designated as ‘foreigners’ by their families, the public, and the medical profession”. Mr McGorry might add here, “and the Australian Government’s health system”.